Dear Friends, I'm really happy that my first post of 2013 is to invite you to kick off the new year with Mike Paré : "Mercury Drawings" at the POPgallery on January 11th, with an opening reception from 7pm until 10pm. The show will remain up through February 22nd. 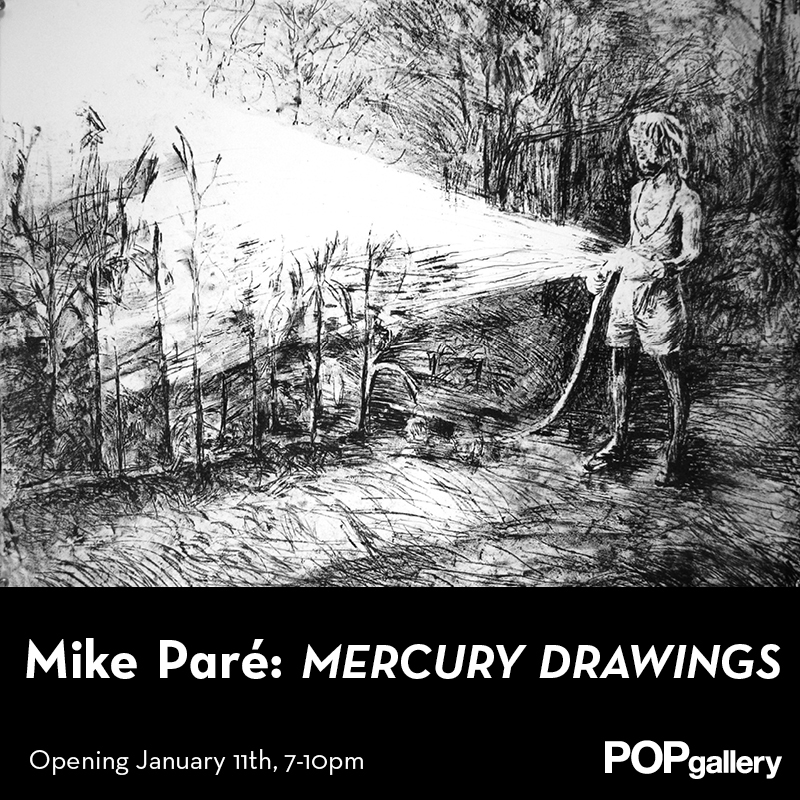 Hannah and I have collected Mike's work for years, and we are honored to announce this show with an artist who has inspired our family and community of friends for so long. I encourage all of you to make this a must-see show as there will be something for everyone from serious collectors to those of you just looking for some inspiration and good vibes. Looking for meaning in images of past ideologies is slippery business. The show takes it’s title from the book Alchemical Mercury by Karen Pinkus. For his first solo show at POPgallery, Milwaukee Artist and California expat Mike Paré presents works on paper that are explorations of cultural and material anomalies. 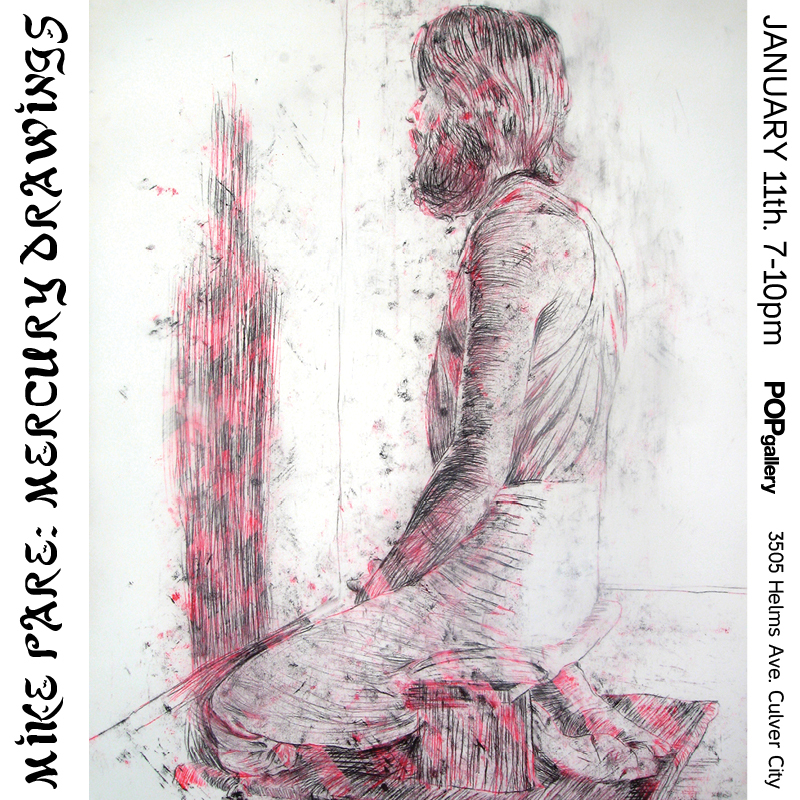 A survey of figurative and abstract drawings from the past six years. Figurative works: In his figurative work, Pare’s exploration of subcultural seekers connects viewers with their own relationships to idealistic concepts and social groups. The mercurial meanings of the work shift with the viewer’s perception. Tie dye works: Working with the familiar drawing materials of graphite and paper, for the ongoing Devotional Goods series, Paré creates large dyed pieces that hint at melancholy and decay even as they radiate intense acid-drenched colors. Print Projects: Rajneesh Things - a free paper- Rajneesh Things is an artwork in the form of an open edition tabloid Newspaper. The twelve page black and white tabloid contains articles, artwork, and designs based in investigations of the material culture of the Bhagwan Shree Rajneesh Movement. In this work, constellations of Rajneesh’s narrative expand beyond rational investigation, and mutate into entirely new forms. Modeled after the original movement publication Rajneesh Times, Paré’s newspaper visually mimics the style of underground press publications of the 1970s and 80s. The work functions as a platform for art making and journalism, but also serves as a coded fictional text and an object of material culture itself capable of everyday dissemination through its expendable form as a free paper. Free copies will be available at the exhibition. 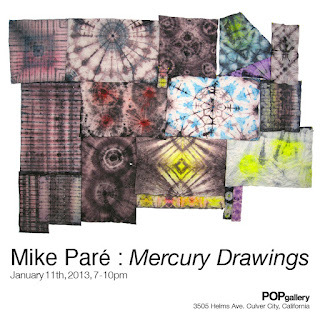 A recent transplant to Milwaukee, artist Mike Paré has lived in Northern California, Brooklyn, New York, and Albuquerque, New Mexico. His artwork is an exploration of drawing materials and practices, based in both representational and abstract methods. Since 1999 his artwork has been exhibited in museums and galleries worldwide including the Schirn Kunsthalle in Frankfurt, the Yerba Buena Center for the Arts in San Francisco, and White Columns in New York. He has created illustrations for clients such as The Guggenheim Museum, Nike, Converse, and Esquire Magazine Russia. Above you will find one of the show cards, and we are including two more below. Please feel free to pull these images and repost, circulate and invite anyone who will be inspired by this special event. (these digital showcards are square in composition, perfect for instagram hint, hint) And stay tuned for more details on a musical performance over the next week and a half. We love art. We love imaginative thinking, organic experimentation, collaborative environments and the incubation of new ideas. Art inspires everything we do, and inspiration is a vital element of our daily needs. 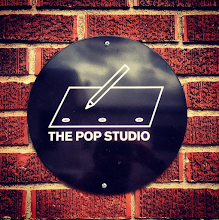 POPgallery provides an environment dedicated to artists, both emerging and established, whose work we are honored to present. Artists in all mediums are invited to show here, and our space functions as a vessel for the artist’s vision. One hundred percent of the profits from the space go directly back to the artists. Looking forward to ushering in another amazing year of art with all of our friends, family, collectors and communities... Happy New Years!